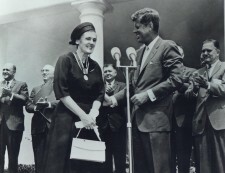 FDA's Frances Kelsey Not Such a Hero? To those of us over 50 years of age, the name thalidomide can still send shudders up and down our spines. Visions of limbless and otherwise deformed babies in Europe come bubbling up from our subconscious, even as we remember how close the tragedy came to involving America as well. The drug was prescribed for pregnant women mostly in West Germany based on falsified safety data supplied by the company Chemie GrÃ¼nenthal. It was effective against pregnancy-related nausea and insomnia, but it caused about 20,000 cases of congenital deformities in infants, many of whom did not survive. If the FDA's Dr. Frances Kelsey in 1961 had not insisted on actually reviewing data regarding the drug's safety, rather than accepting the drug company's assertions, we would have had the same experience as did Europe. That experience has remained imprinted on the drug agency ever since, causing a general precautionary approach to innovative drugs. Not coincidentally, one of those drugs happens to be ... thalidomide. Despite data supporting the drug's efficacy against leprosy and the blood cancer multiple myeloma, it took until 1998 for the FDA to approve thalidomide for leprosy, well aware that once OK'd for that indication doctors would be able to prescribe it for other reasons as well. The move gave doctors the green light to prescribe the drug to patients with serious diseases such as AIDS and cancer, implicitly permitting such off label use. The FDA could not directly approve thalidomide for AIDS patients because there is no controlled data on its ability to help them. Doctors already have many potentially teratogenic therapies at their disposal (i.e. accutane, cancer chemotherapies), and as a society, we place our trust in their ability to prescribe them appropriately. These implicitly dangerous products, when not abused, have significant medical benefits. Why, then, should thalidomide be judged differently? Studies have shown that thalidomide is effective against HIV-related oral ulcers and weight loss. But its primary pharmacological use is in the treatment of early-stage myeloma. It works by modulating certain immune system effects. Recent studies have shown that it confers a significant survival benefit: when combined with the steroid dexamethasone, patients had a 60 percent three-year survival, compared with 26 percent without thalidomide. The long history of thalidomide bears an aura of an epic melodrama: miracle become tragedy become redemption, of a sort. Dr. Kelsey passed away last year at the age of 101; she received a Presidential Award from President Kennedy in 1962, and surely no one has ever deserved it more than she.